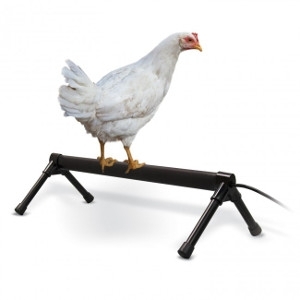 The K&H Thermo-Chicken Perch has a shape and width, ergonomically designed especially for chickens. When roosting, chickens prefer non-rounded perches. And oval perches are more suited to a hens’ footpads, making it easier to rest. The shape of the Thermo-Chicken Perch is designed to give proper balance and to avoid twisted keel and breast bones while roosting. Cord length is 5-1/2 feet and perch is available in two sizes. MET listed. One year limited warranty.